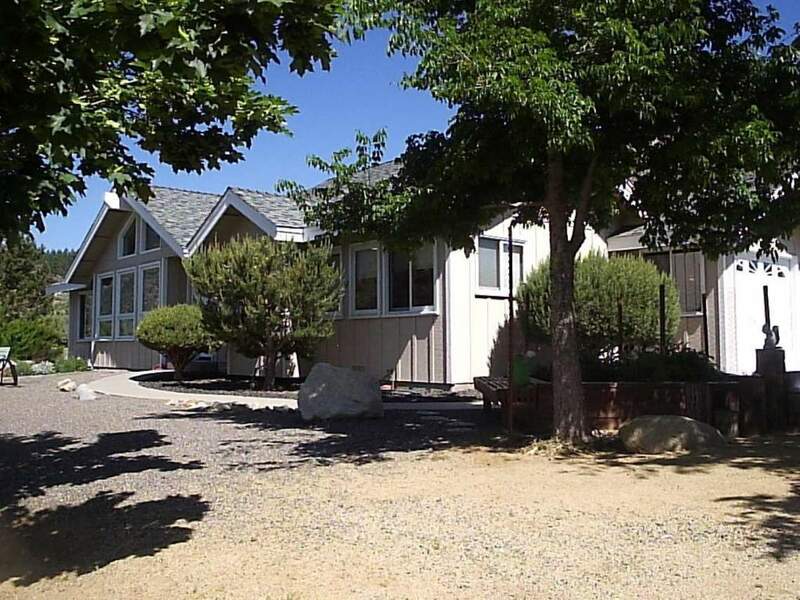 Breathtaking mountain views are the focus of this property situated on 2+ of the most scenic acres in Carson Valley. Located in beautiful Alpine View which overlooks the pristine pastures of the Ascuaga Ranch and the majesty of the Sierras. This well built home features an open great room with woodburning stove, vaulted ceilings and ceiling fans. The spacious kitchen is open to the great room and dining area with tile counters and oak cabinetry. A jewel of a home in rare and much sought location! Oversized 3-car garage PLUS an additional 32×16 ft RV bay. Plenty of space on the lot for additional workshop, garage, or guest quarters on this property. Spacious and open split floorplan with master suite on one side and additional bedrooms on the other. Quiet established neighborhood yet situated within minutes to Lake Tahoe, Reno, world class recreation, entertainment, Costco, Trader Joe’s and more! HOA is voluntary at $100 annual.